At this stage you may experience the wonderful circumstances of students who are impatient and irritated about the circles because they feel they are taking too long to get to the real conflicts. Students may say, “You are wasting our time.” How wonderful! This means that at least some of them are ready to engage in real dialogue. The method described here can support them with this goal. 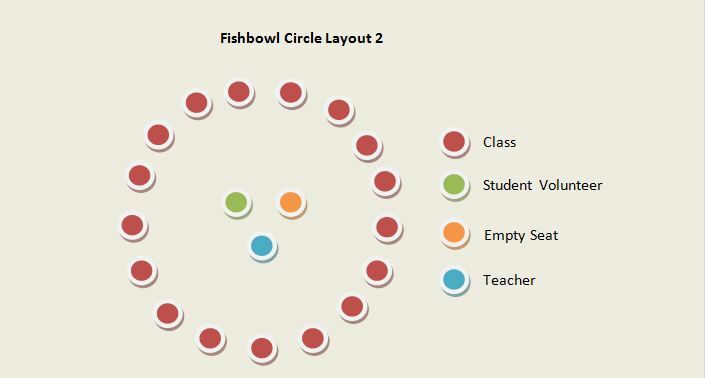 In this circle students begin using restorative methods to repair and improve relationships. Repetition will help a restorative classroom climate to emerge. 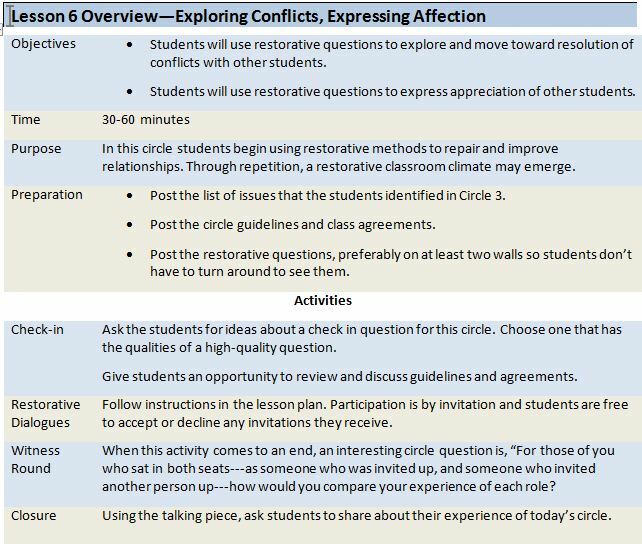 Students will use restorative questions to explore and move toward resolution of conflicts with other students. Students will use restorative questions to express appreciation of other students. Post the circle guidelines and class agreements. An important caution: If students do not trust each other, and if unpleasant social consequences befall those who volunteer to share (either in the class or outside it), this activity may need to be temporarily suspended for a week or two until the circle can identify and deal with the risks. This may entail revisiting and recreating agreements, and/or giving more attention to connection activities. Circle 7: Maintaining Our Community, may be an appropriate and effective way to support a fruitful discussion of this matter. Ask the students for ideas about a check in question for this circle. Choose one, or combine two or more into one high-quality question. Move to the center of the circle and ask for a volunteer who would like to invite someone else in to either set things right or express appreciation. Bring the volunteer into the center; the two of you will sit as two corners of an equilateral triangle. The third corner is left open for students who will be invited to participate. Ask the volunteer, “Is this about making something right, or is it about appreciation?” After they answer the question, ask who they would like to invite to the dialogue. Tell them to speak directly to that person and invite them in. If the invitee accepts, have them bring their chair to the center. If the invitee declines, ask if there is anyone else they wish to invite. Restorative Dialogue When the invitee comes in to the center, ask the volunteer the first four restorative questions. Even though you are asking the questions, they should direct their responses to the other students, as if that student were asking. After the volunteer has answered the first four restorative questions, ask the invitee the questions. Even though you are asking the questions, they should direct their responses to the other students, as if that student were asking. When the dialogue is complete, ask the volunteer to return to the circle, but give the invitee the opportunity to invite someone else up. This will often lead to an unbroken chain of people who come up as invitees, then take the opportunity to ask someone else up. When this activity comes to an end, an interesting circle question is, “For those of you who sat in both seats---as someone who was invited up, and someone who invited another person up---how would you compare the two roles? From time to time a student will come into the center and will have nobody accept their invitation. This is likely to happen with students who are socially awkward and who have alienated most of their classmates. We’ve seen this have a positive effect on behavior afterwards; being declined by several classmates sends a powerful message that may be exactly what is needed to spur self-reflection and social growth. After students gain experience you may not need to ask the questions. They will catch on to who should ask the questions, and when. Allow them to move into this role as soon as they are ready. This is where restorative practices begin to be internalized and become incorporated into the students’ repertoire of social and emotional skills.